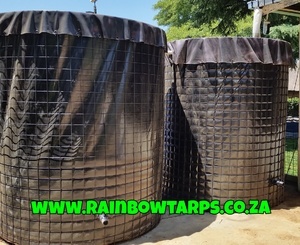 • 450 micron – for use as a standard water tank. Garden use and live stock water. Rainwater harvesting. • 600 micron – for use as a potable water liner (Human consumption). • 700 micron – extra heavy duty liner. (Chemical heavy tank) for tougher and more robust applications. Series 10/10 – Budget / Domestic Range with painted welded mesh wall. Series 50/25 – Industrial Range with galvanised welded mesh wall. All ranges offer the 450, 600, 700 micron liners discussed above. All tanks come standard with a 40 mm over flow and outlet with tap.